You know, it isn’t fair to judge the acting in a kids film as you would any other film. They are engineered to entertain children, and children tend to like things to be over-the-top and ridiculous. Possibly one of the only actors to be able to effortlessly give an extravagant performance in a kids movie without sacrificing the quality of his craft was the late Robin Williams. His performance in this latest was endearing and funny. A pretty good script, even for a kids movie. Especially for a kids movie, the dialogue was pretty smooth. There were some pretty tired jokes, however. This was such a cute and fun film, but I have to call ’em like I see ’em. Of all the female historical figures to choose from, there were only 3 female characters, only 2 of them being historical figures, and both of which were portrayed in a sexist light. Despite the fact that both Sacajawea and Shepseheret have a few scenes together, neither of them ever have a conversation. Furthermore, as one of the primary characters of the adventure, it is quite appalling that Sacajawea hardly spoke at all. The only persons of colour were Ahkmenrah, his parents, and Sacajawea. There were several overused jokes about the ambiguity of Octavius’s sexuality that it became tasteless to the point of homophobia. Hollywood is quick to make a sequel, but they’re stingy when it comes to budgeting the sequels. However, I was pleasantly surprised by how decent the visual effects were in this film. Nothing supremely awe-inspiring, and quite obviously green-screened, but they weren’t bad either. The scoring went well with the film. There were a couple of parts where the sound was slightly off. There wasn’t really anything we hadn’t seen before, but it’s still a lot of fun to see costumes from a bunch of different eras in history come together. I always love sequels, because – even if they’re not great – they bring me back into a world that I love and am familiar with. However, sequels can go horribly wrong when the plot is so muddled that it just doesn’t make sense. 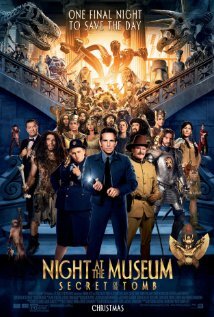 Thankfully, the story for this third installment of Night at the Museum was well thought out. It brought the story full-circle. The story has always been one of imagination and childlike curiosity. This third one is about being forced to forget your dreams, leave your imagination behind, and grow up. And that’s one that hits home, because some of us, this critic included, need our imaginations to live. The dance number at the end, though, is what makes this lose two points. It’s so overdone. I can’t stand unnecessary musical numbers in films, especially when it’s at the end: the story’s finished, the plot’s wrapped up, just roll credits already! Some of the jokes went on a little longer than they should have (ie, pretty much any scene with Laaa in it). I mean, there’s always some level of grandiosity with films that didn’t require a sequel right?